This week in Inc. magazine, I read yet another article about the disastrous effects of colony collapse disorder affecting honey bees around North America. The US Department of Agriculture reports that 30% of hives have been lost to this mysterious epidemic over each of the past 2 years. Even worse, this past winter, over 1/3 of US bee colonies were lost for the fourth year in a row! Colony collapse disorder follows die-offs from the South African beetle in the 1990s and the vampire mite in the 1980’s. Since this never ending fight against nature doesn’t seem to be working very well considering the disastrous drop in bee colonies that continues unabated since 2006, perhaps beekeepers should trying working with nature instead. Organic beekeepers across North America, for instance, are not experiencing colony collapse. Why is this crucial distinction consistently absent from news reports on this crisis? Perhaps the little known fact that conventional bees are bred and handled much like factory farmed animals is part of the reason. The bees that are disappearing are the hyper-bred type who live in hives that are fumigated for mites. They are bred for large size which requires a bigger larval cell and a longer larval phase. These changes make the conventional bees more susceptible to the parasitic varroa mites. 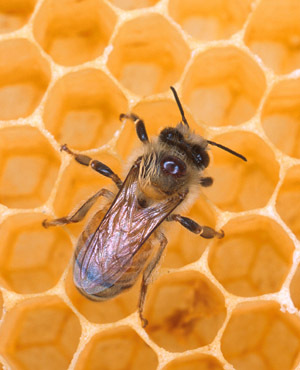 Varroa mites can gradually weaken and destroy a large bee colony over the span of a few years. Natural sized bees seem to detect and destroy the presence of the mites whereas the hyper-sized bees do not. Nonorganic bees are also fed antibiotics and subjected to many environmental stressors like hauling over large distances and exposure to GMO crops and agricultural pesticides. In samples of conventional bees, wax, and pollen, scientists have found traces of over 121 different pesticides. When farmers begin to mix and match pesticides to the needs of their crops, the combination effects on pollinating bees in the area are completely unknown. Conventional beekeepers could clearly learn a thing or two from organic beekeepers. Organic hives are not subjected to pesticides as their beekeepers instead use methods that attempt to mimic the activities of bees found in the wild. The size of organic bees is the same as those found in the wild as over sized larval cells are not utilized. Instead of switching back to larval cells that are the same size as wild honey bees to reduce mite infestation and the need for fumigating the hives, conventional beekeepers have instead opted for “splits”, a technique that divides larger hives in two and introduces a new queen. While this band-aid approach seems to have reduced the problem, it certainly does not solve it. Hence, the bee crisis continues. Or, should I say the conventional bee crisis continues. Feral and organic honey bees are doing just fine, thank you.